IMAGE: Google Street View image showing the street off-peak. 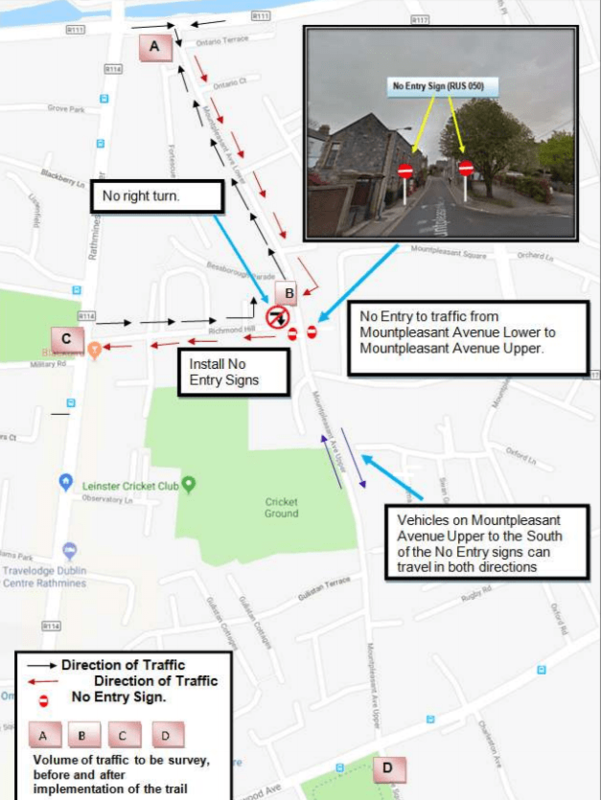 Dublin City Council are to trial a one-way system for through traffic on Mountpleasant Avenue in Rathmines, mainly for safety reasons as the carriageway is narrow for the heavy two-way traffic that uses it. Officials asked councillors to support the trial to avoid a three year process which limits the number of issues on residential streets across the city which can be dealt with. In a report to councillors, officials said that the south east area engineer reviewed issues raised by councillors and residents. 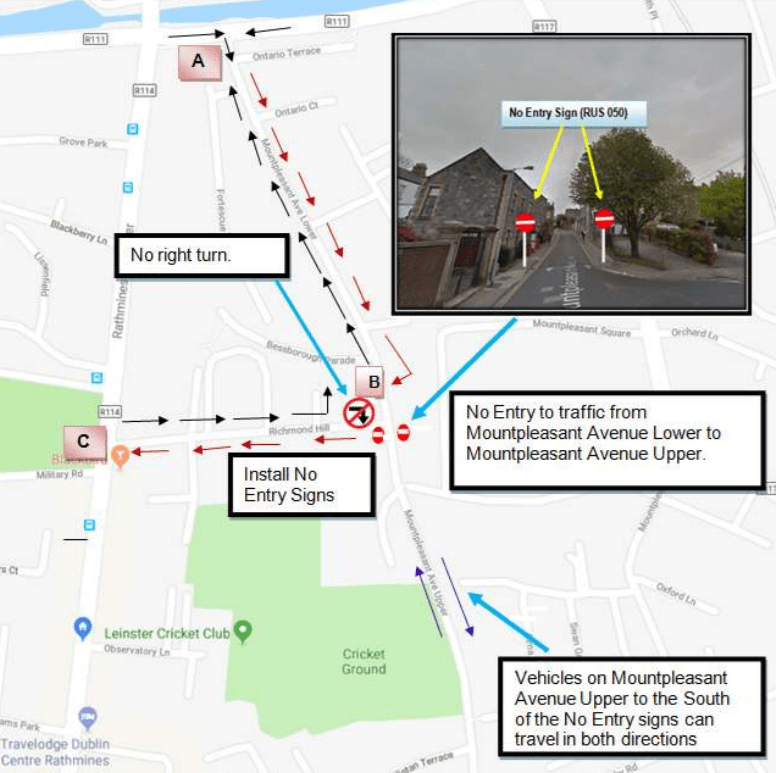 A site inspection found that the carriageway at Mountpleasant Avenue Upper — which runs parallel to the Rathmines Road — is just 4.6m wide and this resulted motorists driving on the footpath. In the northbound city centre direction, motorised vehicles will continue to be allowed to drive through the street. But southbound, away from the city centre, motorists will only be allowed to drive as far as Richmond Hill. Drivers will be allowed to travel in both directions at both side of the signs, just not allowed to travel southbound past the no entry signs which are to be placed on Mountpleasant Avenue, south of the junction with Richmond Hill. The issue was discussed last month at the South East Area Committee of the council. Cllr Ruairi McGinley (independent) said that the trial is “worth a try”, but the council should be aware of possable consequences on other roads. Cllr Patrick Costello (Green) said that permeability in both directions should be maintained for people cycling and the streets should be fast-tracked in the planned 30km/h rollout. Cllr Mary Freehill (Labour) said that she had received about 30 complaints, that there’s huge concern and asked for a meeting of residents. The complains are mainly from Upper Mountpleasant Ave, with fewer complaints from Lower Mountpleasant Ave.
She also objected to the idea that officials had an on-site meeting with residents without councillors present. Cllr Freehill said it was “very worrying” that officials did not reveal the identity of residents who have looked changes to be made. She wanted he issue deferred. Cllr Paddy Smyth (FG) said that the roads are narrow, residential in nature, and “totally inappropriate” for the amount of through traffic using them. He said there should be consultation with residents as soon as possable. He said he was fearful that the only option to resolving it was the “nuclear option of cul de sac-ing” the street while maintaining cycling and walking permeability, but that he didn’t want to upset his fellow councillors by even mentioning that — a reference to the South Dublin Quietway. Cllr Ruairi McGinley said that he would not favour the “road closure” option, and that making it one-way was the next alternative and said that the bottom line was that councillors could not accept people driving on footpaths. He said it was worth a try and that it was unclear what more talking would do before the trial. Cllr Paddy McCartan (FG) said that he wondered why there was such objections to what appeared to a reasonable solution to be a least trialed. Senior executive engineer, Helen Smirnova, said that the council were looking to shorten the process after the case of bollards on a street in Drumcondra which three years involving consultants reports and extensive public consultation. Smirnova said: “If you’re not familiar with Walsh Road, a study we undertook recently, it took three years and it was only four bollards installed.” She invited councillors to attend a workshop event for councilors covering neighbourhood traffic schemes. She said that as there is a serious safety issue in Mount Pleasant Avenue the council are not prepared to wait three years. She said that if the trial does not work, it will be removed. Cllr Mary Freehill made the point that her suggestion for consultation before the trial was being rejected. implementation of the trial in February 2019 and make recommendation to councillors at the area committee meeting in March 2019. Same issue on Belmont Ave in Ranelagh, with the (absurd) difference that cars can park on one side. Countless times I’ve almost been hit on the sidewalk by cars. Bikes are pretty much banished from that place. Bigger problem is the failure of the Minister for Transport to bring the Irish Traffic (Signs) Regulations in line with practice elsewhere. Fair play to the planners for getting this through on a trial basis. It makes a lot more sense to test it before the consultation. When it comes to getting feedback, there will be direct understanding of the before and after options. The council can also gather data to compare against the expected outcome. This road is terrible for drivers too and often causes congestion on the canal. I see Mary Freehill is (once again) obstructive, although now she thinks consultation is a good thing. A clear case for local Councillors to go on the upcoming IrishCycle.com study trip to The Netherlands!